Week 18 of Makeover Monday tackles the issue of the declining bee population in the United States. Data was provided by BeeInformed and the re-visualization is in conjunction with Viz for Social Good. Unfamiliar with a few of the terms – check out their websites to learn what Makeover Monday and Viz for Social Good are all about. 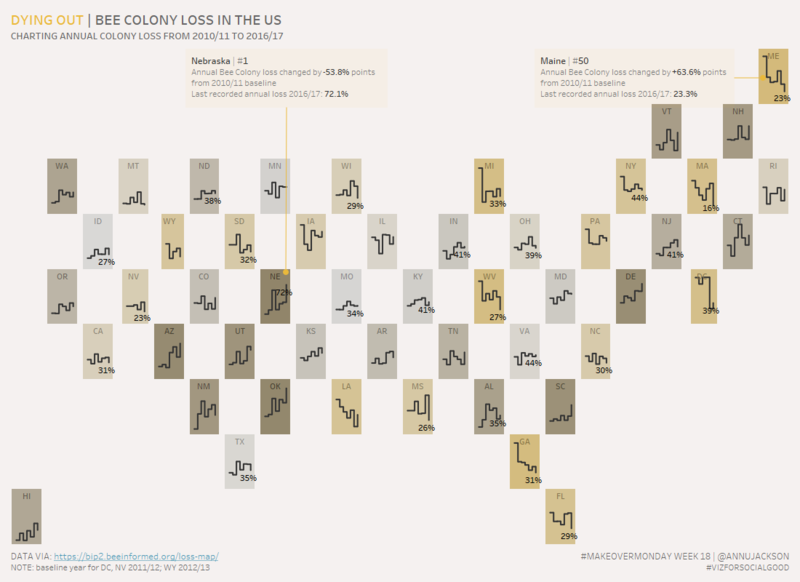 The original visualization is a filled map showing the annual percentage of bee colony loss for the United States. Each state (and DC) are filled with a gradient color from blue (low loss) to orange (high loss). The accompanying data set for the makeover included historical data back to 2010/11. 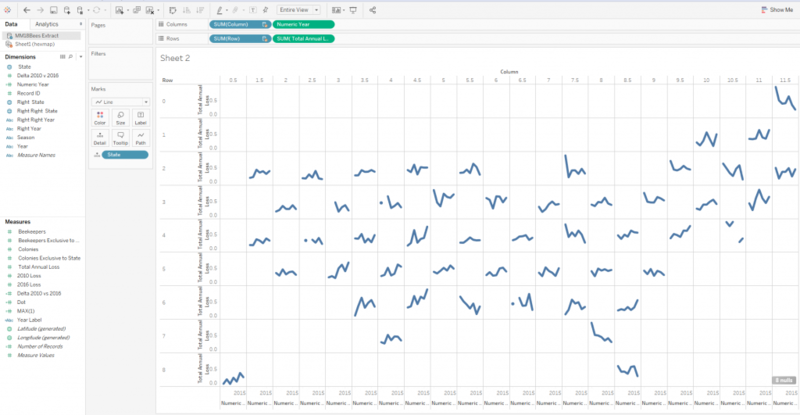 Looking at the data my goal was to capitalize on some of the same concepts presented in the original visualization, but add more analytical value by including the dimension of time. The key component I was aiming to understand was that there’s annual colony loss, but how “bad” is the loss. The critical “compared to what” question. Building out the tile map and beginning to add the time series was pretty simple. I downloaded the hexmap template provided by Matt Chambers. I did a bit of tweaking to the file to change where Washington D.C. was located. Original file has it off to the side, I decided to place it in-line with the continental US to clean up the final look. This to me was a big improvement over the original visualization (because of the addition of time). But it still needs a bit of work to clearly explain where good and bad are. This brought me back to a concept I worked on during Week 17 – using the background of a chart as an indicator of performance. In week 17 I looked at the annual consumption of carbon, forest land, and crop land by the top 10 world economies compared to the global footprint. Background color indicates whether the country’s footprint is above/below the current global metric. I particularly appreciate this view because you get the benefit of the aggregate and immediate feedback with the nice detail of trend. 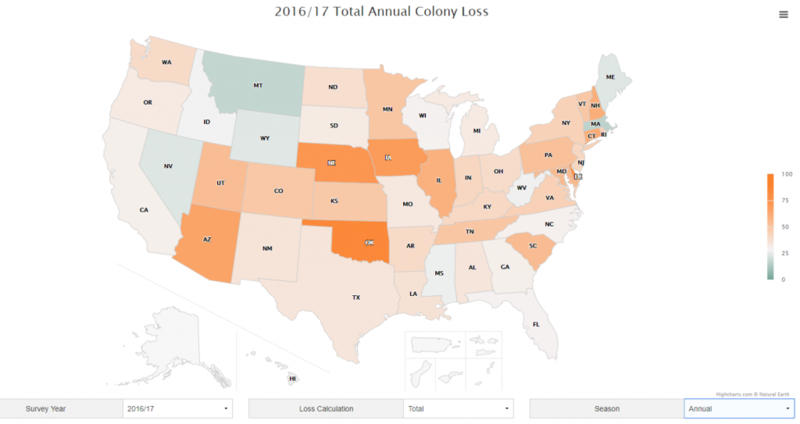 This led me down the path of ranking each of the states (plus DC) to determine which state had experienced the most colony loss between the years of the data (2010/11 and 2016/17). You’d get a sense of where the biggest issues were and where hope is sprouting. 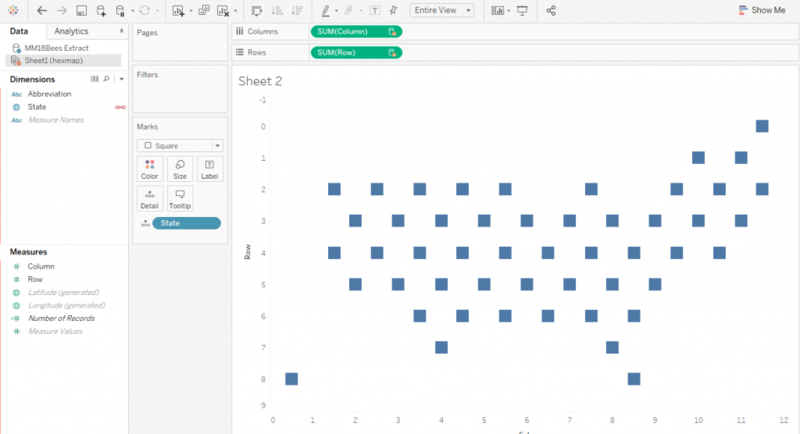 To accomplish this I ended up using Alteryx to create a rank. The big driver behind creating a rank pre-visualization was to replicate the same rank number across the years. 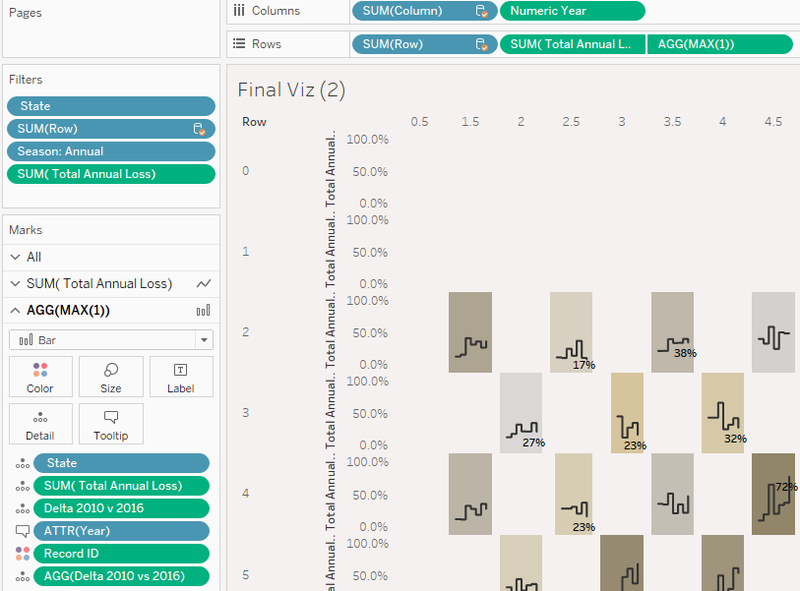 The background color for the final visualization is made by creating constant value bar charts for each year. So having a constant number for each state based off of a calculation from 2010 vs. 2016 would be much easier to develop with. 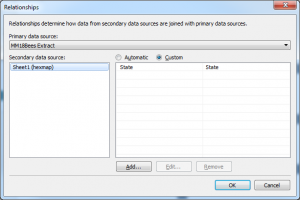 Here’s my final Alteryx workflow. Essentially I took the primary data set, split it up into 2010 and 2016, joined it back, calculated the difference between them, corrected for a few missing data points, sorted them from greatest decline in bee colony loss to smallest, applied a rank, joined back all the data, and then exported it as a .hyper file. This workflow developed in less than 10 minutes eliminated the need for me to do at least one table calculation and brought me closer to my overall vision quickly and painlessly. Final touches were to be a little descriptive to eliminate the need for a color legend and to provide a first-time reader areas to focus on. And picking the right color palette and title. Color always leads my design – so I settled on the gold early on, but it took a few iterations to evoke the feeling of “dying out” from the color range. 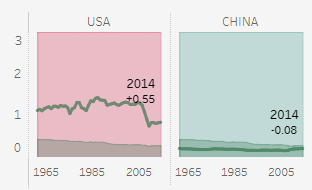 And here’s the final visualization again, with link to interactive version in Tableau Public.